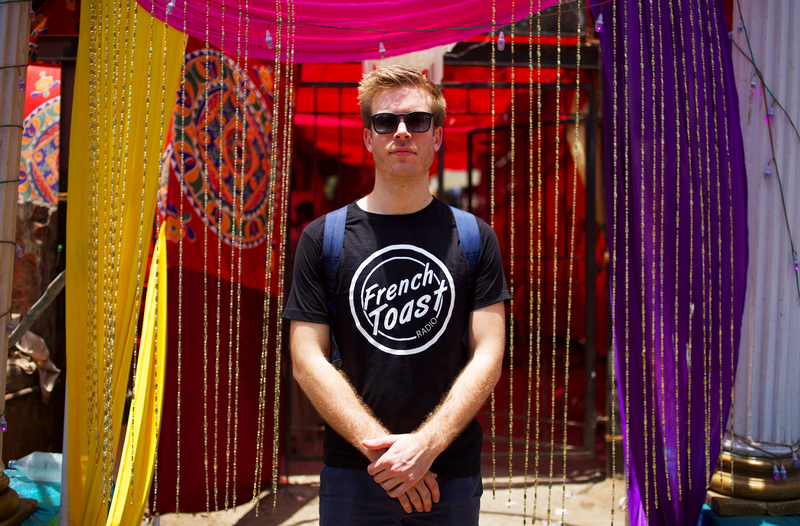 Point Blank radio lecturer Frank McWeeny aka French Toast recently embarked on an eye-opening journey around India to explore the country’s rapidly growing underground electronic music scene. Kicking off in Calcutta, Frank visited six different locations as part of a country-wide tour, meeting and interviewing a range of DJs, artists and promoters along the way, including Point Blank alumni Sandunes. During his trip, he explored what it means to be involved in India’s colourful underground music scene as well as play a number of gigs across a number of different cities. As a radio presenter and club DJ, Frank (aka French Toast) compiled his trip into a beautifully atmospheric and insightful radio documentary, ‘Stories From India’s Colourful Underground’, which was featured on Worldwide FM. Listen to the documentary below and follow on to read our exclusive interview with Frank about the trip. If you’d like to learn how to DJ or become a radio presenter, we offer courses in both these art forms. We even have a school in Mumbai, in partnership with The True School of Music, if you’re in India and looking to study with us. Hey Frank, we really loved the atmosphere you created with the ‘Stories From India’s Colourful Underground’ Radio Documentary! How did the project come together? Heya, thank you for the kind words! I’ve been making radio programmes for close to ten years and in the last five have had the privilege to travel and DJ across Asia. Those trips have allowed me to discover many exciting pockets of dance music culture around the continent. I’d say India and China are some of the most exciting places for electronic music these days. There is so much going on there and it’s still a relatively new stop on DJ’s touring calendars. I’d been to India to play a few times and had always felt something really special there. It felt like a natural progression to bring a radio element into touring, document my gigs and give a voice to those amazing people working hard to establish the scene there. So on my fourth India tour, I recorded everything! The documentary was aired on Worldwide FM – congratulations! How did the connection with them come about? I’ve been a big fan of the station ever since it started a few years ago. I did some work experience on Gilles Peterson’s Radio1 show while I was at university and it gave me so much inspiration. People’s stories are the reason why I work in this industry, it’s so rich in anecdotes and experiences and they need to be told. I feel like WWFM embodies all of that, quality music from all corners of the world coupled with amazing stories. I could not see my documentary being aired anywhere else, so I got in touch and pitched the story to them. Luckily they loved it! What Inspired you to venture on a journey like this one? I’m excited by places which have a growing scene. The UK & Europe are exciting but in a different way, the underground scene has been around for 30 years, so I haven’t really had the chance to see its ‘birth’. In India it’s happening right now, I want to witness it. I’m also fascinated by the culture and musical heritage there. And let’s not forget the food! What was the highlight of the trip? Was there a place/area you found the most interesting? It’s hard to pinpoint one. In terms of gigs, Calcutta and Pune were definitely up there. There are fewer events happening there than Delhi or Mumbai, so there is a real hunger for those types of parties and everyone comes out, it really popped off. In terms of places, I had been to most before but I’d never been to Pondicherry and I was blown away. It’s like a bubble of French heritage in the middle of India. Locals speak French like natives, street names are in French and the architecture, weather and people are all fantastic. It’s also very chilled. The Cities where I’ve played in India tend to be quite manic, Pondicherry gave me a chance to recharge the batteries in the middle of my tour. How is the electronic music scene developing in Mumbai? Mumbai is where it’s at! I’d say it’s the most developed in terms of underground culture. My favourite city in the country for sure. Totally mental and there is just so much happening there; art, music, culture, etc. The scene is quite healthy there and there is a huge young population. They say that if the party is good in Mumbai, it’s as good as it gets. I think I agree. How did you find the scene in Mumbai differs to the UK and Europe scenes? It’s actually not very different in terms of knowledge of the music, it’s on par with the UK and Europe. Where it differs is in terms of availability of venues and opening hours. There are fewer venues and the ‘official’ curfew is 1/1.30am which is very early for the type of party we are talking about. However, venues are sometimes able to swing it and stay open until a little later. It’s changing fast and I don’t believe it will be a problem for much longer. You did a number of Interviews for the documentary – were there any in particular that you found the most enlightening? Yes, I did, and unfortunately, they didn’t all make it in. When you are on location making a documentary it’s important to get as much content as possible, because you won’t get the chance to do it again after you’ve left! I had eight in total and managed to fit six in. I tried to concentrate on different aspects of the underground, I didn’t want any repetition, so it was important for each interviewee to give an insight into a different area of the scene. Meeting someone like Unnayanaa was really special. He’s been active since the late 90s so there was a lot of musical history to cover. He’s a fascinating character with a unique production style. To me, he defines what Indian house music sounds like. I’ve been listening to Sandunes for a while, her music is incredible and she plays live, so meeting her was also really special. I believe she also studied at Point Blank! It was really interesting to hear her views on the scene from a socio-economical standpoint. Is there anything specific you learnt/experienced on your travels that you’ve brought home with you? This is the first radio documentary I made solo from start to finish. It was a huge task! Timing was quite a challenge as I wanted to interview people in every city I played. I was in some cities for as little as twelve hours, which included DJing and sleeping so interviews had to be well planned and prepared. I ended up with close to 10 hours worth of audio, that was another challenge to edit. The way I did it was by focussing on key points raised by each interviewee and place them in a way which was telling a story. Editing a documentary is very different from editing a standalone interview because each story has to fit within the narrative of the whole piece. In a way, it would have been nice to work with someone because it would have enabled me to get some valuable input whilst putting this documentary together, but in hindsight, I’m glad I did it alone as I had full control over the story. That’s the biggest thing I learnt doing this project. Now I’m getting excited about the next one! What advice would you give a Point Blank student looking to break into the broadcasting industry? It may sound a bit silly, but my biggest piece of advice is to be nice and don’t be difficult. You’d be surprised how many people come into this industry with attitude, and how this affects their opportunities. I have sat in rooms when people’s names have come up and someone said something along the lines of ‘not them, they’re difficult to work with’. Another piece of advice is don’t be afraid to ask and drop ‘gentle reminders’ if you don’t hear back. Don’t ask don’t get! And network your *** off! The final piece of advice is to always offer to help and don’t be afraid to do a bit of work for free (within reason, of course, we all need to eat!). People really value help and in my experience, it’s always been valuable and sometimes ended up being paid work! What’s in the pipeline? Do you have any exciting projects you can tell us about? Yes, I am currently working on the second episode which is in another exciting country I’ve been lucky enough to play in a few times. I’m also launching a new mix series called French Toast Grooves which you will be able to catch on all my channels, as well as some fun gigs planned around Europe over the summer. Watch this space. If you’d like to be taught by Frank McWeeny and learn the ins and outs of Radio Broadcasting why not enrol on a Point Blank course? There are a number of different pathways to choose from including the Radio Broadcasting Diploma, Radio Presenting Certificate, Intro to Radio Broadcasting, Radio Summer School and more.